Grab recently announced that it will begin charging passengers a late cancellation and no-show fee. The late cancellation fee will be charged to passengers who cancel a ride after five minutes of being assigned a driver, while the no-show fee will be for cases where the driver cancels the ride after five minutes of him/her waiting at the meeting point (or three minutes for GrabShare), should he/she choose to do so. The fees range from RM3 to RM5, depending on service. This change to Grab’s cancellation policy starts on March 25, which is next Monday. Since the announcement earlier this week, there have been no shortage of feedback from consumers and netizens. Most of it wasn’t very positive, but Grab is confident that the vast majority of users will not be affected by this policy update. The company called for a media briefing this morning to clarify some misconceptions and to address concerns that users might have. 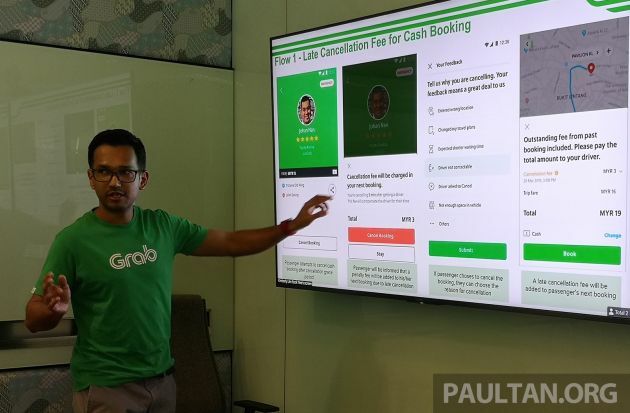 According to Grab’s head of operations Rashid Shukor, the move is to curb intentional abuse of cancellation, which is bad for its community and eventually passengers. He said that the move is for the “improvement of behavior of a small but errant minority, which will also improve ride availability for all of us.” The minority in question amounts to just 0.5% of nationwide Grab bookings in a day, and most users – described as honest and respectful – will never be affected by the move. “The vast majority within our community are honest, respectful users. Unfortunately, we have noticed some repeated patterns of intentional late cancellations and no-shows. Therefore, to protect our genuine users, we have to be tough against the small minority of intentional abusers,” Grab said in a statement. “Grab will not derive any profits from these fees. Instead, all fees go towards compensating affected driver-partners,” the company reiterated. At the briefing, Grab said that there are safeguards to avoid genuine cases being dragged into the net, so to speak. There are algorithms that can detect genuine cancellations, due to cases such as when the driver is late, or if the driver’s location is not right. No fee is incurred in such cancellation cases. Also, a passenger’s intent is checked at several instances, so there won’t be anyone accidentally cancelling. The late cancellation fee will be waived if the driver doesn’t arrive within 10 minutes after the original ETA, and you cancel. “Through advanced machine learning, we are able to monitor real-time data to check for genuine circumstances, such as unforeseen delays in the driver’s arrival,” Grab says, adding that it will keep an open feedback channel via the in-app Help Centre. If a genuine mistake has been made, Grab will reimburse the fee within two working days. In addition, everyone’s “first strike” (where you are liable for the penalty) will be waived, with a reminder from Grab that the move is an infraction. A yellow card, if you will. Compared to late cancellations, no-shows are a bigger problem, Grab says, as the driver would have essentially wasted his time and fuel for nothing, literally. The no-show fee will be charged to you if the driver cancels after waiting for more than five minutes at the agreed location (three minutes for GrabShare, as there are other riders involved), and the passenger fails to respond via calls or chat. Bear in mind that this is not automatic and the driver is likely to continue waiting without cancelling. If he/she chooses to not cancel, there will be no penalty. So how do you pay the late cancellation and no-show fees if you kena? For cashless payments (cards or GrabPay), it’s a simple deduction (refunds are similarly straightforward). For cash riders, the fee will be added on to your next Grab ride. Grab would have already paid your original driver the fee, and the next ride’s driver is merely collecting it back for Grab, from you. 100% of late cancellation and no-show fees go to the driver. Refunds for cash customers will come in the form of a promo code. Although 0.5% sounds small, Grab says that such cases affect thousands of drivers a day, which affects the whole system and other passengers as well. So far, this policy change has been made in Singapore and Malaysia, but it will be rolled out regionally in phases. As for drivers cancelling passengers or asking us to cancel, Grab will deal with them internally, as they have always done. “Similar to our passengers, the vast majority of our driver=partners are also honest, respectful and hardworking. Today, we already have strict measures in place to take action against unfair cancellations by a minority of driver-partners who give the whole community a bad name. Those who repeatedly ask passengers to cancel could result in a suspension or even a permanent ban,” Grab said. Once again, the penalty is for cancelling after five minutes of getting a driver (if he has responded and is moving in your direction) or for not showing up five minutes after he has arrived (or three minutes for GrabShare). The latter is only if he decides to cancel and not to continue waiting. Your first strike will be waived. Fair enough, or not? Tell us what you think. The post Grab’s late cancellation and no-show fees to curb intentional abuse, aimed at 0.5% errant passengers appeared first on Paul Tan's Automotive News. 0 Response to "Grab’s late cancellation and no-show fees to curb intentional abuse, aimed at 0.5% errant passengers"